Dirty Feed, Done Dirt Cheap: Are Consumers Who Shell Out for Organic Meat Eating a Bunch of Bull? 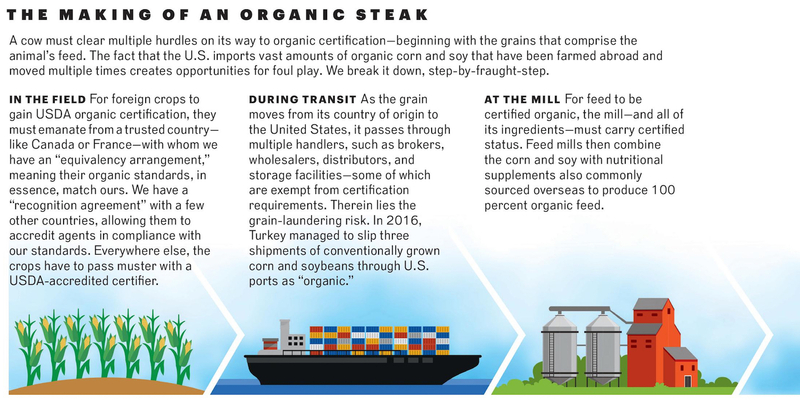 America imports staggering amounts of organic grain from abroad - which allows for sleight of hand during shipping and opens the door to tainted feed. Many Americans assume that anything labeled “USDA Organic” hails from the USA. And for produce, at least, the assumption typically holds true, with the exception of obvious imports like mangoes or coffee beans or tomatoes in January. But the farther an item is removed from the soil, the greater the possibility it harbors ingredients farmed abroad. One needn’t reach the tail end of the supply chain, where the frozen breakfast burritos dwell, to find foreign inputs. Just consider the steak in your butcher’s case. A cow must jump through multiple hoops before earning USDA certification. While the animal may have grazed on chemical-free Iowa pasture all summer, what did it eat during the off-season and where were the feed’s ingredients grown? Roughly 70 percent of our organic soybean supply, and some 40 percent of the organic corn consumed domestically, originates overseas. Chances are, not here. Although the United States remains the world’s largest exporter of conventional grain, we now import a hefty chunk of the organic stuff. Roughly 70 percent of our organic soybean supply, and some 40 percent of the organic corn consumed domestically, originates overseas. Between 2013 and 2016 alone, the amount America spent on imported organic soy leapt from $110 million to $250 million, and on imported organic corn from $36 million to $160 million. As a result, the bottom fell out of the U.S. market: Prices for organic soy plummeted from $26 to $18 per bushel, and organic corn from $14 to $7.50 a bushel – less than what it costs most American farmers to produce the crops. A number of these growers found the sudden spike in imports suspicious. Beyond questions regarding food security and food miles, the glut of foreign grain raised regulatory concerns, especially given the three-year transition period required for organic certification. How could the USDA possibly enforce its strict standards on a rapidly expanding global playing field? “I knew something was up,” says John Bobbe, executive director of OFARM, a marketing co-op that represents several hundred organic grain growers across 19 states. In May 2016, Bobbe needed to move corn from Illinois farms to an Indiana feed mill, and had a tough time finding anybody to haul the load. Turns out, a much bigger gig was drawing Midwestern truckers: A cargo ship called the Federal Nakagawa had just docked in Burns Harbor, Indiana, with 25 million pounds of feed corn in its hold. “That’s as much as 50 of our farms produce in a year,” explains Bobbe, who doubted the corn was organic when he discovered its country of origin. Turkey lacks the flat, fertile plains needed to support export-scale corn and soy production. The politically volatile nation also has a history of attempting to export fraudulent organic goods to the European Union, according to a 2016 report from the USDA’s own Foreign Agricultural Service. Yet, that year, we imported $118 million worth of organic corn from Turkey, more than twice the amount the United States purchased from all other countries combined. The amount we spent on organic Turkish soybeans rose 268-fold between 2013 and 2016. Then, in February of last year, Peter Whoriskey, a reporter at The Washington Post, got in touch. Plying industry informants and Freedom of Information Act requests, Whoriskey managed to unearth shipping documents and other paperwork that laid bare a lucrative laundering scheme. His May 2017 article detailed three shipments of conventional grain that magically turned “organic” as they crossed the sea. All three came through Turkey, but at least two originated in other countries. “Lo and behold, the NOP started looking into it,” recalls Bobbe. 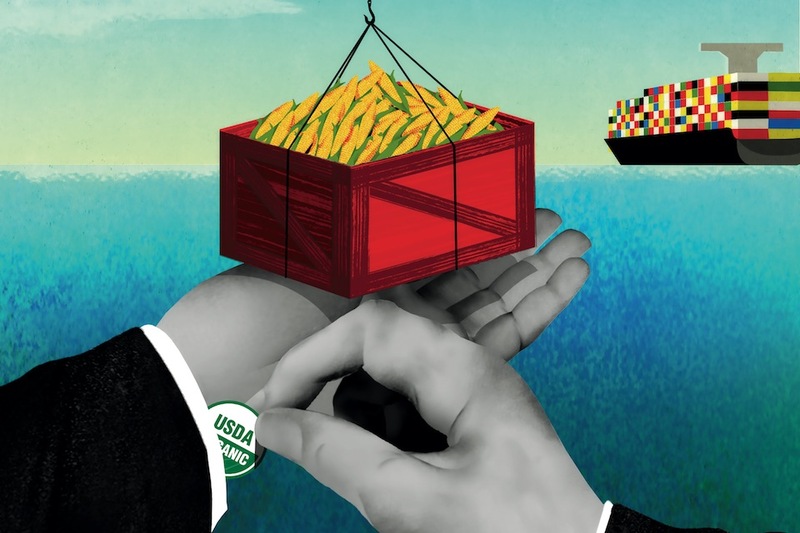 So just how, exactly, does the USDA go about certifying crops grown overseas? In the case of some countries (Canada, Japan, Switzerland, Korea, and the 28 European Union nations), the agency basically takes their word for it, via “equivalency arrangements” that acknowledge a foreign government’s organic standards as equivalent to ours. America has also signed “recognition agreements” with Israel, India, and New Zealand, recognizing certifiers accredited by those governments. Everywhere else, a USDA-accredited certifier must perform the inspection. Of the 80 third-party, organic-certification agencies accredited by the USDA, 32 are based in foreign countries. You might be surprised to learn that, of the 80 third-party, organic-certification agencies accredited by the USDA, 32 are based in foreign countries. Bobbe believes that’s part of the problem. “There is no way the NOP has the manpower to monitor them,” he insists, pointing out that only six or so auditors, none stationed abroad, are tasked with overseeing all the paperwork submitted by organic certifiers worldwide. He also faults the NOP for failing to inspect inbound cargo. U.S. Customs and Border Protection might, but those agents aren’t trained to scrutinize organic-certification documents. “Your chances of getting caught with a shipload of fake organic grain are next to nil,” Bobbe says. And should you get caught, the maximum fine per violation is $11,000 – not much of a deterrent when millions can be made off a single shipment of fake organic corn. Kelly Damewood, director of policy and government affairs at one of the largest certification agencies in this country, California Certified Organic Farmers (CCOF), agrees that the NOP needs more funding, though she warns against overstating the lapses. “In the rare cases of fraud, it can often be traced back to an uncertified handler,” says Damewood. “Technically, if you are not repacking it, processing it, relabeling it, or turning it into anything else – if you are just a pass-through entity – then you are not required to have certification.” Last September, CCOF started requiring the companies it certifies to complete a new form, verifying that every handler is complying with organic standards. That same month, following a strongly worded directive from the USDA Office of Inspector General, the NOP issued new guidelines for certifiers aimed at closing loopholes along the supply chain. The agency also stopped a freighter named the Diana Bolten as it arrived in Bellingham, Washington, loaded with “organic” corn for the same importer associated with the Federal Nakagawa. Sources with knowledge of the incident told Bobbe that a portion of the shipment was rejected by the USDA as fraudulent. The USDA declined Modern Farmer‘s request for comment on the matter. Another sign of progress: Last September, Representatives John Faso (R-NY) and Michelle Lujan Grisham (D-NM) introduced the Organic Farmer and Consumer Protection Act, which would authorize $5 million for the NOP to upgrade its enforcement systems and technologies, and mandate ongoing budget increases at a rate that matches the growth of the organic sector. The bill has garnered broad bipartisan support, with a mix of co-sponsors from both parties, including celebrated food-movement champions like Representative Chellie Pingree (D-ME). 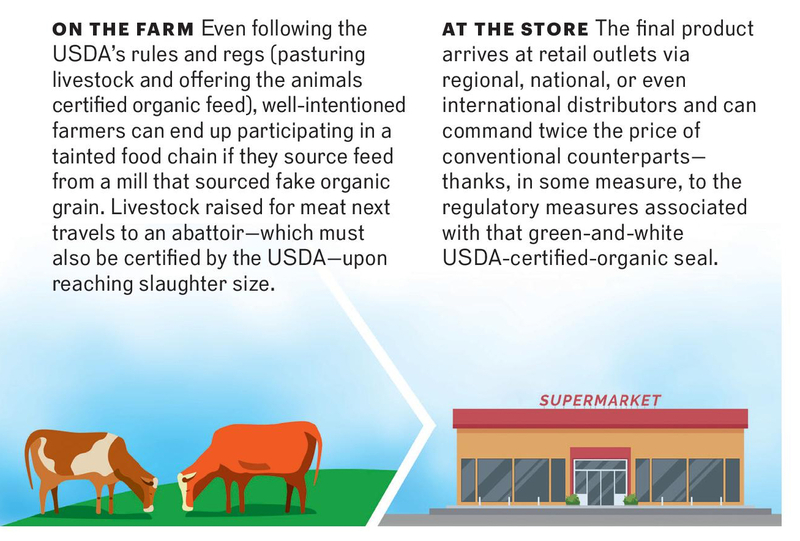 “This is the system working more or less as it’s supposed to,” says Mark Lipson, a former organic and sustainable agriculture policy advisor at the USDA. Lipson worries that extrapolating a few specific, if glaring, fraudulent incidents into a systemic indictment of the NOP risks undermining public confidence in the organic label – and would be unjustified. “The Washington Post report demonstrated that the enforcement structure needed to catch up with the growth in the market, but the National Organic Program still works better than a lot of other regulatory divisions,” says Lipson. Bobbe isn’t so sure. While the amount of certified organic grain flowing in from Turkey has decreased since 2016, to approximately $80 million apiece for soy and corn last year, his network of farmers continues to suffer. One of them, Bob Stuczynski of Amherst, Wisconsin, says, “Organic farmers in America can hardly move their corn unless they want to fire-sale it.” Stuczynski estimates that he’s lost tens of thousands of dollars in revenue over the past couple years. And an OFARM analysis found that imported organic grain cost U.S. farmers a total of $300 million to $400 million from 2015 through 2017. Bobbe recently attended a conference convened by the European Organic Certifiers Council and the International Federation of Organic Agriculture Movements in Odessa, Ukraine, across the Black Sea from Turkey – an apropos location. Some of Bobbe’s E.U. counterparts are convinced the Turkish mafia is barging in conventional corn from Ukraine and other Black Sea countries, then shipping it out as organic to Europe and North America. “It’s an international crime syndicate,” he says.